What can I possibly say about Iceland? Except that it truly has to be seen to be believed. The landscapes were unlike anything I’d ever seen before, often feeling like I’d stepped into some mythical fairy tale. You can see why so many popular TV series are shot here (Game of Thrones to name just one). 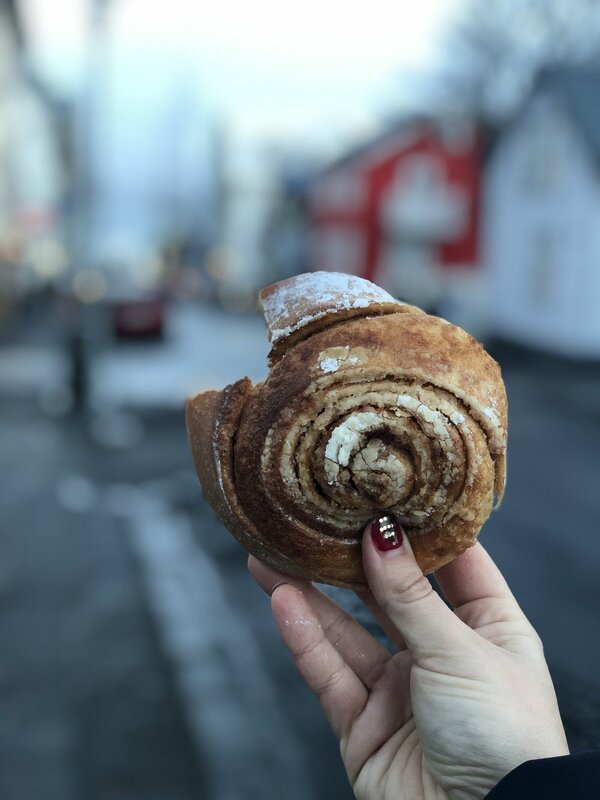 We flew into Reykjavik on December 26 for 3 days of adventure between Christmas and New Years Eve and it most definitely wasn’t enough time! We only covered some of the South Coast and could have easily done with another day or two for that area alone. I have no doubt I’ll be back in Iceland soon - hopefully catching the Aurora Borealis this time. We didn’t quite see the magnificent greens and blues you see in Instagram snaps, but did catch white light moving across the sky in the most unusual way - certainly a sight to see colour or no colour! We spent our first night in Reykjavik at an airbnb right in the centre of town. There are so many amazing airbnbs that are well-priced and super central. We also stayed in Vik as our kind of hub during the day trip drives along the South Coast. Whilst Vik was a great location and famous for it’s black sand beach, the airbnb we stayed at was not great. First of all, the owner forgot we were coming and so the house was dirty, with unclean towels and sheets everywhere. Not a great start. So for that reason, I won’t share the link but definitely have a look around Vik as a base! The first day! What would a visit to Iceland be without a dip at the famous Blue Lagoon? We spent much of our first day here given that sunrise wasn’t until 11am. We entered for the first session (approximately 9am) and spent some time having a coffee and getting changed before we jumped in, just in time for the sun to rise. This was hands down one of the best experiences and I’d highly recommend doing it once. I probably wouldn’t do it again on another visit to Iceland, but definitely one to tick off the bucket list. We didn’t bother with getting the mud mask package and just opted for the basic package, which to be honest, was more than enough! We left the lagoon at approximately 2pm and arrived back in Reykjavik hungry and with prune like skin haha. So naturally, it was time for somewhere cosy, warm and ready to fill our hungry bellies! We stumbled across a restaurant called Old Iceland - definitely order the cream of shellfish soup! I am not a soup person, but this was insane. It was so good, we went back on our last day to eat it again! That afternoon, we had a wander around town (in the dark) as the sun sets early here, 3pm! There are a huge number of great little boutiques, bookstores, coffee shops with steaming pastries and buns ready for munching! So many great tourist shops that weren’t overtly naff too. Lots of amazing Icelandic folklore books and fun for adults and children alike. There was also a wonderful Christmas decoration shop that I could have stocked up big at, but sadly with only carry on, I couldn’t manage it. We were there between Christmas and New Year, so I’m not sure if this shop is year round. From there, we made walk up to the Hallgrimskirkja Church for the view. We didn’t bother going up the top as it was freezing and dark, but would definitely do so if we go back to Reykjavik. On the way back to our airbnb, we stopped at Braud & Co for Cinnamon Buns which is just a few minutes walk from the church! This is another must. They were still hot and you could smell them up the street! After a refresh at our airbnb , we had dinner at ROK. Just down from the church and near Braud & Co. Great food, cool vibe and great cocktail list. Hubby and I shared a few dishes, including reindeer, which was delicious! Day 2 saw up drive from Reykjavik to Vik (about a 2.5 hour drive) with stops at Seljalandfoss waterfall then Skogafoss waterfall. Definitely take the stairs up to the top of Skogafoss. It’s a heart pumper, but worth it for the view! Work up an appetite for a feed at the restaurant at the bottom. It’s not particularly fancy, but when you’re out in the cold, you’re definitely ready for a heart stew and pint of Icelandic ale! From there, we drove to Vik and went to a local brewery, Smiðjan Brugghús, for beers and dinner. Reynisfjara beach is right near Vik then Dyrhólaey is another beach with amazing views. The black beach rock formations are integral to Icelandic folklore. With stories of how these columns were actually trolls who used to lure in ships from the ocean. But one day the trolls got caught by the sun of dawn and were frozen into solid stone. If you fancy a further walk on this beach (an hour and a half one way), then walk on to find an abandoned plane wreck to explore…be mindful however, that on very windy days this isn’t recommended as it can be a little dangerous! We didn’t get a chance to do this, but would definitely do next time! The next day, we made for Jökulsárlón and Diamond Beach. About a 2.5 hour drive, but with stops at Fjaorarglijufur the river canyon and Svartifoss Waterfall to break up the journey. 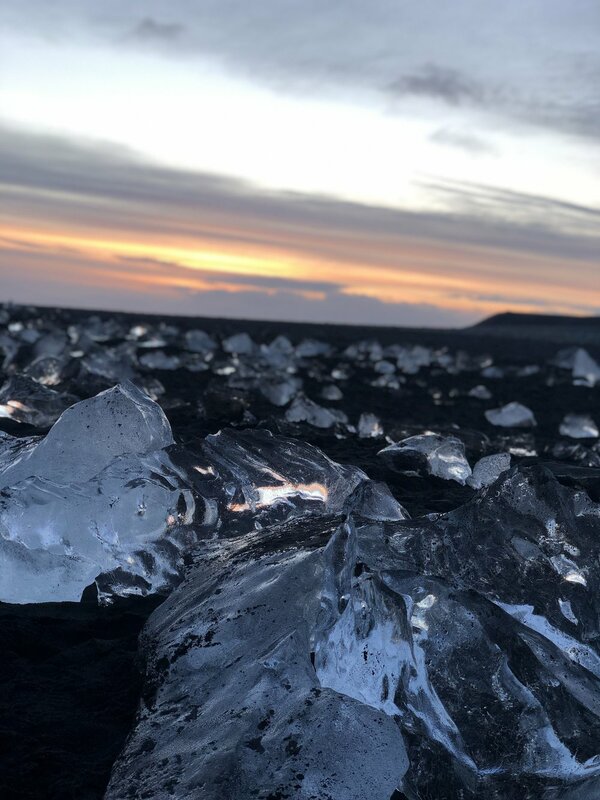 Jökulsárlón and Diamond Beach were by far my highlight of the trip. No words or photos can describe just how incredible these places of outstanding natural beauty were - like nothing I’d ever seen! If we had more time, I would have done one of the ice cave/glacier tours for sure - we kicked ourselves for not staying another day to do this! That night we had dinner in Vik at Restaurant Sudur Vik - it was popular! So definitely make a booking. Most decent places in Vik seem to need bookings, so definitely look into this beforehand. The next morning, it was back to Reykjavik to fly home! This definitely wasn’t the last time we’ll go to Iceland - it felt as though we only covered a teeny corner of this magnificent country. I would love to return and visit the north and do the golden triangle - plus the Aurora! We didn’t manage to see them whilst we were there, but given that they are number one on my bucket list, I think another trip might be on the cards soon!